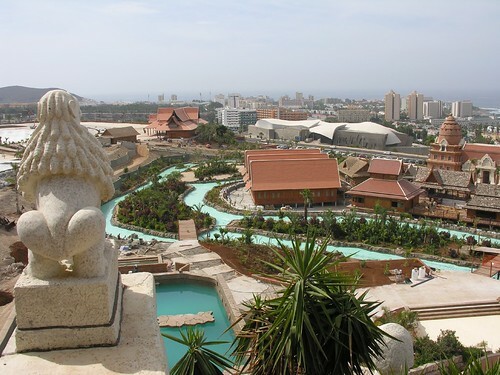 March 17, that was the day I was shown around Siam Park, the water kingdom theme park in Costa Adeje, that was already well over a year late to open. There was clearly quite a bit left to do, none of the rides were ready to board, although I did get to go to the top of the Tower of Power, where a workman was still on all fours cementing the tower edging. I was quite happy to report the stated May 1 opening date, but that soon came and went. The soft opening is the vital testing period by invited parties of people, ticket sales agents, tour operators etc, to try out the facilities. No matter how good any plans are, there are always practical problems once in use, in the building trade they always have to deal withÂ a â€œsnagging listâ€ of such problems, once a place is in use.Until that hurdle is jumped, there can be no proper opening date, if the soft opening discovers problems, then there could be even more delay. 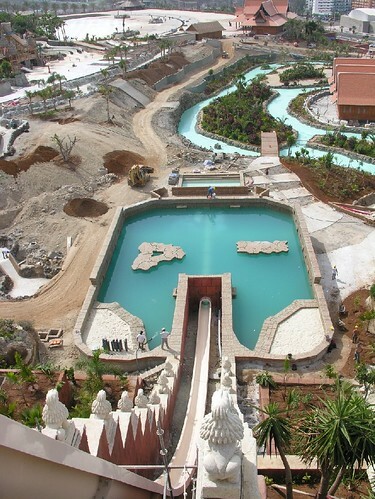 Itâ€™s not good for the image of Tenerife, holiday makers that felt let down at not being able to visit Siam Park, are now coming back for their next holiday and finding it still â€œnearly readyâ€ you would think someone might be keen to recoup some of the 55 million euros (Siam Parks figure) it has cost to build.Oh well, roll on christmas. 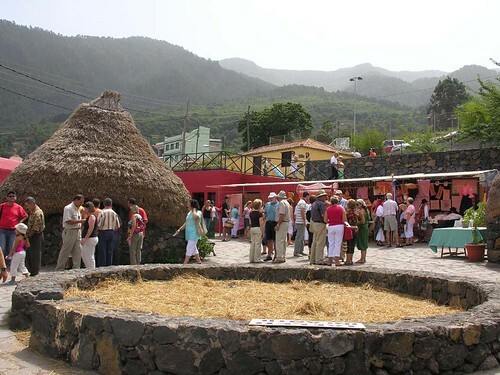 You can tell the year has sped by, when the annual Pinolere craft show gears up for three days of tasty history, high up above Puerto de la Cruz, in the foothills of the La Orotava valley. This year will be the 23rd annual show and it runs from Friday September 5 to Sunday September 7. So what’s the big attraction, I have been to 4 of the last 5, basically its a combination of the setting and the large concentration of every food, craft and ancient art that the Canary Islands can muster. The village has about 700 inhabitants and all year they keep alive the old skills and trade the cereals and products they make, but the annual show is a chance to throw open the doors to around 40,000 people over the 3 days. 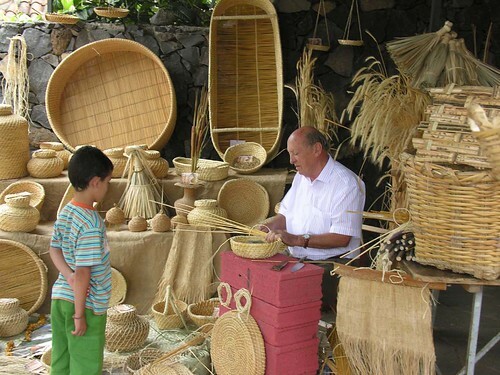 One of the big regular events of the show, is the International Cestoria competition, thats basket weaving to you and me. Last year this and the other stalls attracted entrants from 30 countries among the 128 exhibitors. I always find it a challenge to see how much home made cheese, biscuits, cake, wine and sweets I can get through, well it’s all cheap and cheerful. Follow that up with some beer and traditional meat and potatoes or sweetcorn, and the day flows nicely. My only dissapointment was finding that the making of the famous La Palma cigars didn’t involve rolling them on the thighs of young Canarian women. The showground covers 10,000 square metres in several layers of terraced hillside below the majestic pine forest, topped with low cloud. If the sun breaks through, it can be gorgeous, but otherwise a spare layer of clothing is a good idea. Good news this year, Titsa, the green national bus company, are running shuttle buses from La Orotava bus station. As is the way out here, timings are a bit flaky, sort of every hour, but be a bit flexible, at least there are some nice cafes at the bus station. As for driving,Â it is sign posted up from Puerto de la Cruz, and you can’t argue at 2.50 euros to get in. CD Tenerife were back on the island this weekend for 2 friendlies, and they were very impressive in winning both. Friday evening down at the Las Americas stadium they beat CD Marino, from 2 divisions below CDT, 2-0. Born again forward Cristo scored his second pre season goal and eye catching new boy Alfaro added the other. A decent workout, with the usual mass substitutions late on and a crowd of 800 or 1,200, depending on which paper you believe. Sunday wasÂ expected to be the much sterner test,for the Teide Trophy,Â against Primera side Athletico Bilbao at La Orotava, they had won all their friendlies to date, including victories over Millwall and Charlton on a short English tour. The Armada Sur had a coach up, but with the extra distance, we powered past our usual TF1 motorway beer stop at the OasisÂ and broke the journey at a petrol station, with bar, near Los Rodeos, the north airport. I often wonder why they built an airport there, it always seems to suffer from very low cloud which nearly envelops the airport, and it’s chilly, many of us wereÂ questioning the wisdom of wearing shorts. After a few beers at a bar just down from the ground we paid out 15 euros (ouch) and went in. I went to a pre season game there last year, and it was immediately obvious that this was virtually a full house with fans taking every lofty vantage point and a large section of Bilbao fans. The Sur and the other main noisy peÃ±as (fan clubs) took the far corner and started the usual songs and chants as we anticipated a tough match. Tenerife came out like a steam train and were all over Bilbao, after 10 minutes an Alfaro corner found Nino, and the little striker did what he does best, popped it in the goal. CDT faded a bit as the first half went on and Bilboa tied the score with a Munoz goal. The second half saw Tenerife really take control, Kome floated the ball in from the left and Oscar Perez (pic) charged in to make it 2-1. Could it get any better? yep, Kome was again involved, shooting at goal and when it rebounded to Nino, he was lethal to make it 3-1. Despite the local Guardia Civil standing down in front of us and trying to stare us out all game, the final whistle was the call for everyone to pile on to the pitch. The Teide Trophy was presented to Cristo Marrero, it looked like a largeÂ under arm deodorant, not sure what happened to the large flat landscape of Mount Teide that is normally presented. The players all mingled with fans on the pitch and posed for photos, before we all piled on the coach for the long trip back down south. Even out here in the land of sunshine the credit crunch is biting, and coupled with the dwindling number of tourists, the euro is under pressure. But hold on, who is that wrinkly looking savior, leaping to the rescue? it’s our old friend the pesata, gone but not forgotten, it is now being used to prop up struggling business’s. A dry cleaners, Tintoreria Avenida, Â in Las Palmas, Gran Canaria has started accepting pesatas, and customers are taking the bait. The Euro was brought in just over 6 years ago, amid a lot of wailing and gnashing of teeth, but Banco EspaÃ±a will still convert pesatas into euros, but you have to have a decent amount. The bank estimates that there is still a staggering 1,778 million euros worth of pesatas out there, made up of 950 million in notes and the rest in coins. Even now, quite a few Spanish products and services have the euro and pesata price shown, and many older citizens refer back to pesatas to guage how much something is in “real money”. A lot of people blame the introduction of the euro for prices going up, but some business owners chose to round up prices out of greed, while others did a straight conversion. All this could be to come for the UK one day, then maybe spending a penny will become known as euro-nating. Although there are a few other places in mainland Spain that will take the pesata, it’s a gimmick and the Pios of Gran Canaria seem to have embraced the euro, they don’t mind using them as missiles to throw at Tenerife fans in the derby games. Still, it might be worth while diving down the back of your sofa, to see if you can find a Fistful Of Pesatas, someone must have the missing ones. Just a thought, if shops are going to open up to other currency, I have some UK change I can try and pass off, and maybe those 1970 Esso World Cup coins could buy me a few bottles of Dorada. It seems like forever since my last fix of live football, well mid June to be precise, thankfully the wait is over and CD Tenerife have started on their pre season friendlies. This is a great time of year, all things are possible and all teams are equal, surely this will be our season for promotion and a good cup run. Tenerife always have to wheel and deal carefully in the transfer market, no big money signings for us, the club are chipping away at their debt, it stood at 44.9 million euros in December 2005 and is expected to drop below 30 million by the end of this year. Some new faces have been brought in, 2 new goalies and some new forwards to help ourÂ free scoring hero, Nino (pic) as he hopefully continues to bang in the goals. In keeping with tradition, Tenerife have started with a training camp and some light friendlies over on La Palma, their first competitive game was a 0-0 draw on Sunday against Tijarafe. This weekend sees a flurry of activity, with a Friday evening game, kick off 8.30pm,Â at CD Marino, the Las Americas ground that many visitors think is our home. This will be a chance to try all the squad out, everyone will get a run out, even Gladys the tea lady will probably get on for the last 5 minutes. Sunday will be a much sterner test, Athletico Bilbao from the Primera, are the visitors for an 8.30pm game at La Orotava, the pre season games tend to be spread around, a good chance for the smaller teams to get a much needed boost in gate money, and as the home pitch at the Santa Cruz HeliodoroÂ has just been re-laid, it will give it time to settle. For the first time I can remember, the Armada Sur will be running a coach to a pre season game, our Canarian friends from the Frente Blanquiazul also have a coach up, so we will be meeting up for a pre match aperitif or 2. Next Thursday CDT fly to the mainland to play Real Valladolid and back in time for a Sunday game against Universidad Las Palmas at La Laguna. At last on Saturday August 23, we get a chance to pile back into our home stadium with the visit of Dutch Premier team Roda J C , that should be a real treat and a good test before the Segunda Division league programme kicks off on Sunday August 31at home to Nastic. I’m all ready, my season ticket is on order and i have even washed my scarf. No doubt it will be another roller coaster season with the 2 derby games against the Pios of Las Palmas, engraved on our hearts for November 23 away and April 26 at home. Vamos Tenerife !